(CNS): Although it is apparent that the Coalition for Cayman (C4C) is supporting several candidates in the forthcoming election, at present it has only formally endorsed three. The third would-be politician to get the nod from C4C, which is still calling itself an advocacy group rather than a political party, is Jacqueline ‘Jackee’ Haynes, who was an early supporter of the C4C concept. Haynes is running on the coalition ticket in George Town and joins Roy McTaggart and Winston Connolly, who are the only other two candidates to receive the coalition’s formal endorsement. However, the group is also expected to endorse Haynes' fellow George Town candidates, Sharon Roulstone and Jude Scott. Mervin Smith and Tara Rivers, who are hitting the campaign trail in West Bay, are also expected to be endorsed by the group. The C4C said it is still dedicated to electing independent minded leaders who will be accountable and free of partisan political ties, but the group has not said how its candidates will form a government. It has not been made clear if any of them are elected whether the group will support those candidates joining forces with a party. Although the C4C is expected to endorse at least ten candidates, enough to form a government if they are all elected, if they fall short it is not yet known how those candidates would be expected to work with government or whether they would take a position on the opposition bench. 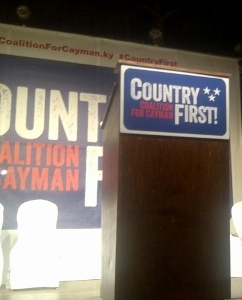 The C4C credited Haynes with “extensive and successful business experience”, which they said could help the Cayman Islands back on the right track. “We know Jackee will always put the good of the Country First as her motives are true to Cayman,” an unnamed spokesperson for C4C stated. “With her independence and passion, we can put aside party differences and get back to doing what is right for Cayman like improving education, protecting families from crime and maintaining our status as one of the leading economic centres in the world,” the coalition added. Why does c4c allow jude, sharon, mervyn, tara allow themselves as c4c if they have not yet endorsed them?? Why is stephan not allowed to call himself s c4c candidate? Isnt his application being treated the same? The revenue projections did not materialise; that's what caused the demise of PPM. That wasn't in their control so it was nothing they did willingly. Since the FFR, the Budget was developed based on 75% (or less, perhaps, if in only certains areas) of the revenue projections. Does anyone have any idea how much was given up in stamp duty and import duty waivers over the last 4 years (under the UDP administration)? This is not including the stamp duty concessions that are in place for first-time Caymanian property buyers and the like. CNS, please FOI that for us quick, quick. From May 2009 until Friday (8/3). We want it within 30 days. It should be easy enough to report on so no extension til 45 days necessary. I wonder how close to $63 million it will be? C4C? What's going on there? When are they going to endorse Jude Scott, one of their founders? Come on, now. Do they take us for complete idiots? But what merit does an endorsement from C4C carry? There isnt one person in that coalition whose endorsement would carry any weight with me. I am capable of thinking and choosing for myself. All the C4C are doing is highlighting for the voters which independent candidtates arent really independent because that endorsement is not free and will have to be repaid at some point. C$C and UDP are accusing Alden and the PPM for not putting solutions foeward, but where are their solutions? One thing you can say about Alden and the Progressives, they have a proven record of getting things done. When they get them done, they are accused. I would rather vote for a party of doers than for a party of sell outs!! VOTE PPM ON MAY 22nd. Do not let the FreeMasons control our country and that's what C$C is!!! PPM ALL THE WAY BABY! What a tool Does this ppm blogger realize that Alden and Wayne are Freemasons so what does that say about the ppm? Alden is not a Free Mason. I know this because I am one. But wait Winston is and so are most of the C4C execituve so whats the big deal? Lodges exist all over the world the Royal Family, Obama are all Free Masons. I've been hearing quite often lately that the C4C group/party are the ones that have all of the solutions. Really? Name one solution. Not saying that they are devoid of answers its just that I haven't heard them. I simply hear the same political rhetoric that I hear year after year. A lot of empty words with no real substance. Which is quite disappointing to say the least considering these are supposedly the candidates who are equipped vast experience in the private sector. I want to hear specifics as to how you plan to address the problems of the country while also taking in to consideration the fact that our coffers are empty. It is easy to lament what past politicians have done but it is very different once you are faced with the reality of how dire the situation is for our country and the onus is on you to turn it around. The smoke and mirrors continue. Of course Sharon Roulstone will be the next endorsed. Seriously, why not just tell who they all are now? Why the staggered approach? Is this the best way to get multiple headlines? And thus in the people's minds, so your PARTY can win? I hope the candidates of the C4C think twice before they even consider mentioning anything about transparency during this campaign and the reason for that is that the coalition is shrouded in more ambiguity than any of the parties! If you vote for the PPM you know that you are also casting a vote for Alden as the premier and the same goes for Mr. Bush if you cast a vote for the UDP. But as for the candidates of the coalition there is no real indication of who they will support if elected. Will they agree to work with other candidates? If so, who will you work with and who won't you work with? Or will they feel obligated to follow the wishes of the C4C's executive committee as they are the ones who are vetting the candidates and given them their endorsement? The C4C just confuse me. They claim to not be a party but rather an advocacy group. While at the same time what they are advocating for is that we elect THEIR candidates. I'm sorry but isn't that exactly what a party does? C4C appear to have an agenda, an agenda that the people do not appear to know anything about….do these Islands need to start afresh with people that are not clear and transparent, didn't these Islands just go through all that…no more. These Islands need fresh, clear, transparent people in government that keep the people informed and involve the people. No C4C, don't see anything from you all yet. I dont dare if they are staggered or all at once. i am just happy that we will have some good quality independents to vote for. C4C has been busy at the computers again. I see the familiar pattern of clone one line supportive posts at 15:57, 15:59, 16:01, 16:02 and 16:04. Obviously the work of one person. I love how every C4C candidate is deemed to be fantastic by these posts even before we have heard their positions on anything. Excellent choice. Please keep the good work going. C4C has viable solutions, Alden and the PPM crippled the country with debt from poor choices when they were last in power, and as the party leader he has been quietly letting the UDP foster and grow corruption without standing up and fighting for the Country. Jackee will do us proud, and will not be one to peacock around! Great choice C4C! Crippled the country? Is it crippling that after finally spending money on needed infrastructure the government is only spending 10.5% of its revenue to service that debt? Wouldnt we all be happy if we only spent that much of our personal income to pay for our loans or mortgages! Is crippling that investments be made to improve the quality of lives of the people? Or the educational facilities for our children? Hitherto nothing much was done since the 1970's. Is it reckless that our public debt is less than 25% of our annual GDP (the aggregate value of our economy)? Most countries would kill to have it that low. AND that includes our unfunded public service pension liability that the UDP paid nothing against in the first three years until they were forced to in the last year by the UK. Contrast that with the PPM who paid that liability down by $15M per year for EACH of the four years they were in government. Crippling or responsible governance? So you see nobody has forgotten anything. You are just being convenient with your facts. We also havent forgotten who assisted the UDP in driving up the cost of living and doing business so dramatically- many were C$C including McTaggart and Scott! Look it up in the Hansard in McKeeva's own words! Pretty clear who did the crippling! It does? Well let's hear them instead of crying down other political parties. But wait – I thought you said only the official parties did that. Jacqueline I know you are what this country needs– a strong independent leader! The more i listen to Ms. Haynes, the more i like and respect her. She is a leader that will help our country back on course. C4C please find someone in Bodden Town!! Johann Moxam endorsed Alva Suckoo on "The Panel" recently. He said if he could vote in BT he would vote for that candidate. Right at the end he says "If I could vote in Bodden Town I would vote for Al Suckoo"
Excellent choice C4C. Keep them coming trough the pipeline. party or no party, C4C has presented some viable options!!! Jackee has been most impresive. Happy to see her put herself forward for GT. And there are plenty of Alden haters too. The man has the charisma of a door and too full of himself. If he could at least speak properly. I hope people remember that he left this country in near bankruptcy! Can you describe one single solution put forward by Alden in the last four years? Get rid of McKeeva. 3 times. That is a big part of the solution. Read the PPM 2009 Manifesto. What has the C4C proposed? Chinese building our Port? C4C STOP the BS and Propaganda all of your Candidates websites say nothing about solutions, the truth is you don’t have any. You are asking the Voters to have faith once you get elected you will figure it out. That’s not an acceptable proposal. You all have backgrounds in the Financial Industry, you make over $150,000 per year how can you understand how ordinary people live? Have you ever had to decide between paying you light bill and buying food for your kids? Have you worked in a small businesses where you have to decide between paying your suppliers or paying your pension contributions? If less than 11% Debt Service Ratio (DSR) is bankrupt then 90% of private citizen’s are bankrupt too. Most banks loan private individuals up to 35% DSR…people stop and think before you write, repeat or follow such BS. So Roy and Jude have charisma? Mac has charisma you want him back? Or does that mean once elected C£C will bring Mac back as Premier because he has charisma? Stop tearing down PPM want are the C£C solutions? Or is it that you don’t have any? Or you just hate Alden so much solution are not important? Udp and Ppm have created over 12 years of formulas for us and not one single solution. I will be giving c4c a chance this election, because we cannot afford another 4 years of our country in incapable hands. Re-cap c4c solutions for me please as I have heard none! The C4C are the same peoople that backed the UDP. That is all you need to know. How are you going to elect them…C4C are running?